Vyacheslav Mikhailov is one of the most important artists of the Contemporary Russian Art Scene. He uses the language of form, colour and line to create his compositions. The texture of Mikhailov's paintings is so rich and recognizable, reflecting his own unique style. His paintings are three dimensional which he achieves by implementing the old technique of "levcas", which was used on Byzantine and Russian Icons. Vyacheslav Mikhailov has not blindly followed the technique but adapted it with crude dramatic fabrics, combined with a chalk priming and developing and emphasizing a new structure of painting, creating his own artistic language. He knows what to say and how to say, each of his paintings is always a statement. When we look at his paintings we immediately recognize the work of a Master. Vyacheslav Mikhailov was born in 1945. In 1977 he graduated from the Academy of Fine Arts where he majored in painting, taking his tuition under the legendary Russian Art Professor Yevsey Moisejenko. From early 1980s on, Mikhailov began participating in various exhibitions, both in Russia and abroad: in Europe, China and in America. He also held a One-Man show at the Russian State Museum (1995) and contributed to a group exhibition at the Hermitage Museum (2004) . He is a member of the Russian Association of Artists and a member of the State Artists Association of Italy "ITALART". He was also awarded the title of an `Honoured artist of Russia'. Since 1977 he has taken part in over 200 exhibitions in Russia and abroad (among them 61 One Man shows). At present his works are acquired by the State Russian Museum, St. Petersburg; the Tretyakov Gallery, Moscow; The Hermitage, St. Petersburg; Museum of Contemporary Art, USA and in many art collections all over the World. Vyacheslav Mikhailov is one of Russia's post-Second World War generation of artists. He was one of non-conformist artists of the Soviet era. Vyacheslav Mikhailov had the courage to do what he believed in when the country was under the Communist Rule and while he was never popular for the Authorities because of his independence and disagreement with their dogma and their acceptance of only one artistic style: Social Realism. Mikhailov was one of the very few at the time who still continued experimenting and developing his own style. He was able to withstand the pressure to conform to the ideals of totalitarian art even after he had been threatened by the KGB. Mikhailov's human strength and dignity combined with his genuine talent got him a level of recognition which just a few other Russian artists have attained. His understanding of colour and texture and how they develop a structure and influence each other allowed him to create a very powerful art works. To paint for Mikhailov means to reflect his own dramatic life experience through art, no matter what it is about: people and their emotions , city and its space. His creative quest is as yet far from being completed; has recently brought Vyacheslav Mikhailov to the Architectural Abstract. Abstract Art was started with the first abstract painting of Russian Wassily Kandinsky, who was a pioneer of abstraction; Russian Kazimir Malevich completed his first entirely abstract work, the Suprematist "Black Square", in 1915. 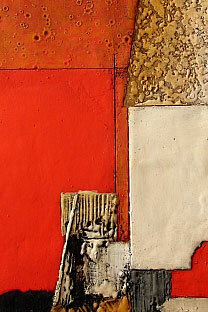 Vyacheslav Mikhailov was not only influenced by those pioneers of the Abstract but he has developed his own techniques with its own unique textures. Abstract Art was and still is one of the most Revolutionary art movements of our time when the objects are disappear like smoke. Colour instead of being a description of the object has become an object itself. Mikhailov's pallet is full of hot reds, ash blacks and the odd splash of sky blue. When you look at the colours on Mikhailov's paintings you are amazed how shockingly blue his blue is, how emotional his red is and how dramatic his black is. What is that about? Where does he get those colours? Do they really exist in the nature? Or it is just how and what the Master feels. It is difficult to understand, impossible to describe exactly. It is again about personal impressions and connections between the viewer and the masterpieces. When the famous English photographer Anthony Armstrong-Jones, 1st Earl of Snowdon came to Russia to take pictures for his book Great People of the 20th Century, Vyacheslav Mikhailov was the only Russian Artist to be included in the book together with other high achievers. There are not enough words to describe emotional fulfillment when you look at the out of this World Art of this highly gifted Master. Mikhailov possesses a genuine artists professionalism and a profound philosophical insight which makes his contribution solid and guarantees the emotional validity of his testimony. Vyacheslav Mikhailov' s reputation as one of the most serious masters of Contemporary ART is secure.